(This joke is based on an actual event which is a part of golf lore around the world). A golfer is playing a round of golf with his buddies. On the sixth hole, a hole over water, he proceeds to flub nine balls into the water. 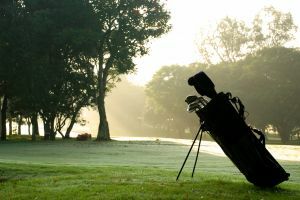 Frustrated over his poor golfing ability, and about ready to hit somebody, he heaves his golf clubs into the water, and begins to walk off the course. Then all of a sudden he turns around and jumps back in the lake, his buddies apparently thinking he is going to retrieve his clubs. When he comes out of the water he doesn't have his clubs and begins to walk off the course. Then one of his buddies asks, "Why did you jump into the lake?" And he said, "I left my car keys in the bag."